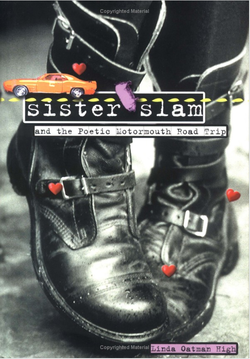 Laura Crapper, a seventeen-year-old combat-boot-wearing poet with spiked red hair, renames herself Sister Slam and hits the road with her best friend, Twig. On the way into the slam poetry world of New York City, they hit a pig, get pulled over by the cops, fight with a poetry contest's judge, lose the contest, get into two more fender benders, fight with each other, and finally land on the front page of a newspaper in New York City for their amazing impromptu performance at the famous Tavern on the Green. The girls and their fresh style of poetry take the city by storm, but when Laura's father back in Pennsylvania has a heart attack she must face her fears about home and the still-raw loss of her mother. An inspiring romp of a coming-of-age story, written entirely in Laura's in-your-face slam poetry style, that proves you don't have to give up your home in order to live your dream. in the House of Crapper. Plus I was way past chunky. who was a space case. and a total waste of time. of a lumpy old couch. of your walk. You sulk." I just let her talk. but I was maybe okay. in the sport of spoken word. I’d always wanted to slam. of a teeny weeny tree. tethered to the House Of Crapper. and a map, and ZAP . . .
would be one happy rapper . . .
My new name was: Sister Slam! wrong with your name, Laura." and did he turn red. to know in high school. Do it. I can’t stop you, anyway."